The next time you are faced with a Global Warming Alarmist – dare I say I repeat myself- you may ask them if they have evidence that would suggest their models are accurately reflecting reality. The chart above from Dr. Roy Spencer via CoyoteBlog suggests that the models are off. The warming from manmade CO2 without positive feedbacks would be about 1.3C per doubling of CO2 concentrations, a fraction of the 3-10C predicted by these climate models. If the climate, like most other long-term stable natural systems, is dominated by negative feedbacks, the sensitivity would be likely less than 1C. Either way, the resulting predicted warming from manmade CO2 over the rest of this century would likely be less than 1 degree C.
It’s not global warming that I deny, it’s the Alarmist nature of the disciples of the religion that I disagree with. This entry was posted in Climate Change, Politics: National and tagged Alarmist, Skeptic. Bookmark the permalink. A licensed mechanical engineer (retired) who has been researching this issue for 6 years, and in the process discovered what actually caused global warming, has four papers on the web, that you may find of interest. They provide some eye-opening insight on the cause of change to average global temperature and why it has stopped warming. 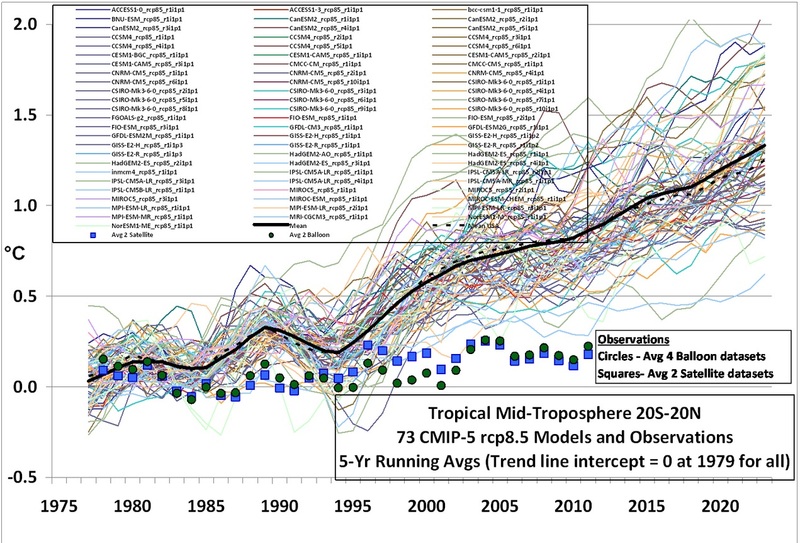 The papers are straight-forward calculations (not just theory) using readily available data up to May, 2013. The second paper is ‘Natural Climate change has been hiding in plain sight’ at http://climatechange90.blogspot.com/2013/05/natural-climate-change-has-been.html . This paper presents a simple equation that, using a single external forcing, calculates average global temperatures since they have been accurately measured world wide (about 1895) with an accuracy of 90%, irrespective of whether the influence of CO2 is included or not. The equation uses a proxy which is the time-integral of sunspot numbers. A graph is included which shows the calculated trajectory overlaid on measurements. Change to the level of atmospheric CO2 had no significant effect on average global temperature. The time-integral of sunspot numbers since 1610 which is shown at http://hockeyschtick.blogspot.com/2010/01/blog-post_23.html corroborates the significance of this factor. A third paper, ‘The End of Global Warming’ at http://endofgw.blogspot.com/ expands recent (since 1996) measurements and includes a graph showing the growing separation between the rising CO2 and not-rising average global temperature.